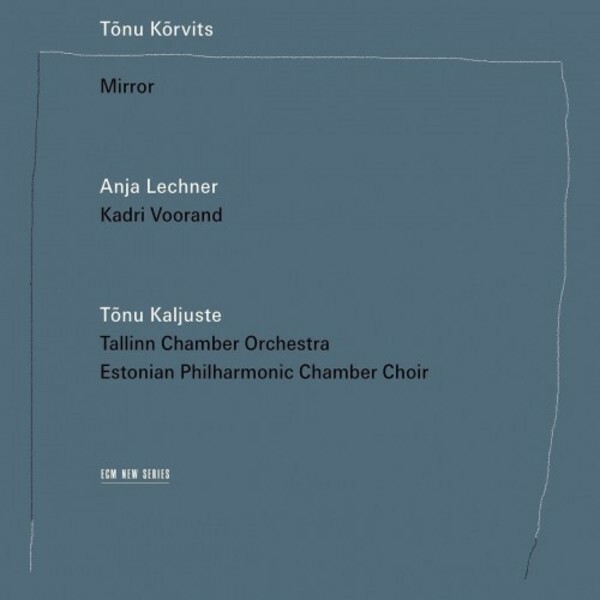 ‘Mirror’ is the first ECM New Series album from Estonian composer Tõnu Kõrvitz (born 1969), who emphasizes his links to his homeland’s music at several levels. The album begins with a fantasy on a song by Veljo Tormis. Like the older composer, Kõrvitz has been influenced by folk song and archaic musical tradition, which find their echo in the refined and texturally-rich spectrum of his own, labyrinthine pieces. His music is well served here by the Tallin Chamber Orchestra and the Estonian Philharmonic Chamber Choir under Tõnu Kaljuste’s assured direction and by soloist Anja Lechner. Lechner’s cello is foregrounded in Peegeldused Tasaset Maast (2013), Laul (2012, revised 2013) and the album’s largest work Seitsme Linnu Seitse Und (2009, revised 2012), a collaboration with the poet Maarja Kangro, which is both choral suite and cello concerto. In these ‘seven dreams of seven birds’ the choir sings in Estonian and English and the cello conjures both birdsong and swooping flight. Tasase Maa (Song of the Plainland), a fresh arrangement of a Tormis melody, has Kadri Voorand as vocal soloist, supported by strings and by Tõnu Kõrvitz on kannel, the Estonian psaltery.